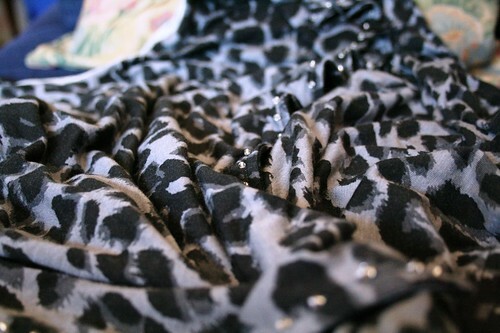 I'm obsessed with this leopard grey/black print. On Sunday I went to Target and bought myself a scarf & footless tights in this print and now they are added to my collection of tops, tanks and t-shirts that are already in my wardrobe. I don't know what it is about this print but whenever I see it, I'm drawn to it. I guess worn the wrong way it can look trashy but I only ever wear it with dark jeans or a black skirt and not much other colour in my outfit. I love the way it looks. It adds a but of edge to an otherwise plain outfit. It's my pattern of choice. In other news it's been released that The Killers will be in Melbourne on Sunday to perform at Good Vibrations festival. This is surely a win for the festival and any fans (like myself) who have been looking forward to this for a long time. I just hope they're coming because they want to and not because they are being forced due to contractual obligations. I'm certain they'll give it their all and I'll be there to witness it. To be honest it's been a hectic week. I worked all weekend and I don't have another day off until Saturday which puts me on about 9 days straight (I think, my brain isn't allowing itself to function properly). It's been a great time for me at work as I bettered my personal best last month and have already smashed it this month. Yes! Embrace the leopard print I say!